Using an evidence-informed practice (EIP) framework, this blog will help you understand the potential care implications of this research. What is evidence-informed practice (EIP)? 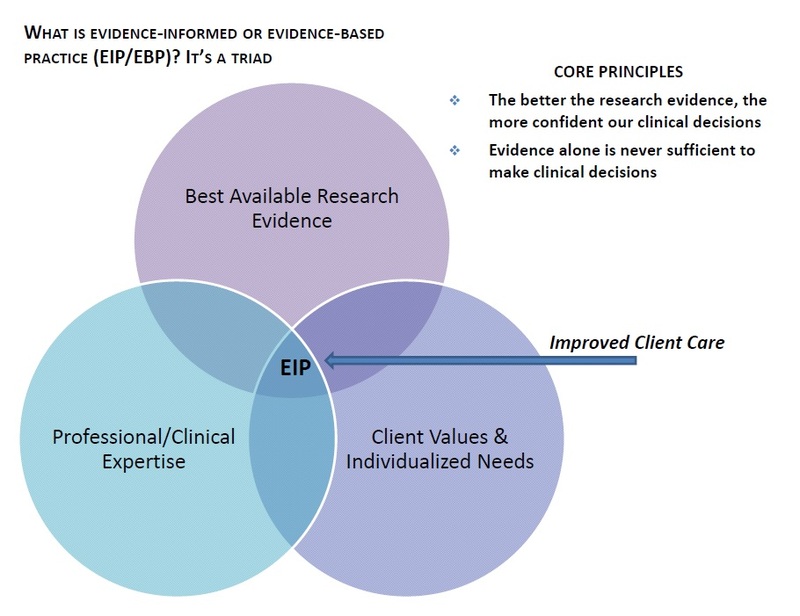 Also referred to as “evidence-based practice,” “evidence-based care” or “evidence-based medicine,” an EIP framework is the intersection between the best available research, your professional expertise as the practitioner, and the client’s individual values, needs, and context. The study included data from 18,343 women who had home or birth center births; 6,521 (35%) of these women had waterbirths. The researchers found no evidence of harm to babies who were born underwater. Whether looking at 5-minute Apgar score, neonatal transfer to the hospital, any hospitalization in the first 6 weeks, NICU admission in the first 6 weeks, or neonatal death, the results were clear: babies born underwater fared as well as those babies whose mothers did not choose a waterbirth. While the study confirmed that mothers who had a waterbirth were not at increased risk of postpartum transfer (for a maternal indication), hospitalization in the first 6 weeks, or perineal/uterine infection, the study did suggest that mothers who choose waterbirth have a slightly increased risk of experiencing perineal trauma. This study is the largest ever published, and the first study to be published in a US population. It provides solid evidence that waterbirth can be a safe and viable option for many lower-risk pregnant women, though midwives and other health care professionals should, as with all childbearing decisions, discuss potential risks and benefits with families and engage in shared decision making. One final important point from the research: there were actually THREE groups. Waterbirth, non-waterbirth, and intended-waterbirth. This latter group consisted of those women who had planned a waterbirth, but then did not have one. Women and neonates in this intended waterbirth group had the worst outcomes of the three groups in this study—more on them later. For now, what you need to know is the main conclusion from the study: waterbirth is not associated with ANY adverse outcome for the baby, but it might be associated with an increased risk of tearing for the mother. This study demonstrates what midwives already know: waterbirth is safe for babies. The take home message: nothing in this study suggests that midwives need to change current practice to increase safety for neonates during waterbirth. However, we want to apply our clinical expertise to dig deeper into the adverse finding of increased perineal trauma for some women. The data cannot tell us the full story because there are not enough variables to create a discernible pattern—or in other words, while the research suggests that there is an increase in perineal trauma among women who gave birth in the water, there was no pattern in terms of where or how bad the trauma was. What we can do, however, is consider this question from a clinical perspective. Possible contributing factors include: How long was the woman in the water? Were “hands on” or “hands off” techniques used for perineal support and protection? Could the birth position (hands and knees, squatting, etc.) be a factor? Your experience as a midwife allows thoughtful reflection on why an increase may have occurred, and this forms the professional expertise area of an EIP approach. You may also be questioning why outcomes were worse for the intended-waterbirth group, compared to the waterbirth and non-waterbirth groups. From your clinical experience, you may have come to this logical conclusion: if complications arose during labor, the midwife may have requested that the client get out of the tub in order to facilitate closer monitoring. This may mean that midwives are engaging in appropriate screening to ensure that clients remain good candidates for a waterbirth (of course, some women also just choose to get out of the tub on their own accord). On the flip side, you may have noticed that the best outcomes were among the waterbirth group. Does that mean that waterbirth is actually beneficial? Not necessarily. What we have to remember is that “best” and “worst” is relative to the other groups involved. In other words, the outcomes of babies born under water were better compared to those babies not born under water. Why would the outcomes for waterbirth babies be better, comparatively? One explanation is that the lowest risk women stayed in the water, just like the higher risk women may have been asked to get out of the water. What this means is that the location of birth (waterbirth, intended-waterbirth, non-waterbirth) may be serving as a proxy for the risk level of the mother. In research, we call this “selection bias.” Recognizing this bias helps us to understand why even though it may look like waterbirth is beneficial (because those babies have the best outcomes), the improved outcomes are likely a reflection of who stayed in the water and who did not. While selection bias may mean that waterbirth by itself does not improve outcomes, it also does not take away from the key finding: waterbirth is safe for babies. We can say this with certainty because all 6,534 neonates in the waterbirth group were, in fact, born underwater, and there was no evidence of increased risk for any outcome. Midwives provide informed consent on the risks and benefits of waterbirth using a shared decision-making framework. You counsel clients using what you know from research and your own practice, and the family then decides what route is best for them and their baby. The new understanding of increased risk of perineal trauma will need to be discussed. Other key findings that demonstrate the safety of waterbirth should also be shared, such as: 1) there was no increased risk of mortality or morbidity for newborns; and 2) that waterbirth was not associated with maternal hospitalization in the immediate or first six weeks postpartum, or with maternal infection. By engaging shared decision-making and EIP frameworks, you can (and should) also draw on the larger body of literature on waterbirth (see the references list in the current study to get you started) as well as professional practice guidelines, including a soon-to-be-released evidence-based waterbirth clinical bulletin drafted by a multi-stakeholder group (anticipated release: Spring 2016). Collectively, existing research combined with your expertise as a midwife allows you to engage in a detailed and comprehensive conversation with clients, where autonomy in decision-making can be exercised within an EIP framework. Excited about this research? We are too, and we owe it all to you! This research would not be possible without the many midwives who contribute data to the MANA Statistics project. The ability to even study waterbirth highlights the value of the MANA Stats project, which provides a rich dataset focused on physiologic birth practices. Without this data source, large research studies on practices like waterbirth would be difficult, given their relative infrequency in the hospital. So, midwife contributors, many thanks for taking the time to advance research on midwifery care and physiologic birth practices! And for those midwives not yet contributing, you can sign-up anytime! Learn more, here. Can you please tell me in detail about EIP process, researches and statistics about underwater birth of babies?